Air Out Your Article Portfolio With These Tips! You want to make sure only the best content appears along with your name to build trust, credibility, and exposure. 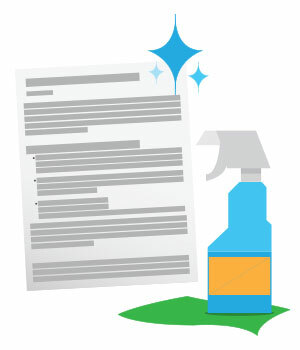 That’s why you should perform a little “spring cleaning” on your article portfolio to remove any old, under-performing articles that may be reflecting poorly on your reputation. Are you ready to air out your article portfolio? Grab your “feather duster” and “trash bins” by taking the time to consider whether you should keep, update (and resubmit for review), or toss articles using these tips. Determine if the article is out-of-date. Current events will often shape our writing and out-of-date content will sneak in, whether we want it to or not. Out-dated references can confuse readers as well as make you appear out-of-tune with your niche. Keep: The article is evergreen and contains no dated material. Alternately, the article covers a major milestone in shared history; e.g., landing the Mars Exploration Rover. Update: The article contains only a few references to dated content that’s no longer relevant and can easily be removed; e.g., “Recently in the news …” would be brief mentions that date your content. Consider whether the article meets your quality standards. All articles should be unique, relevant, transparent, and informative based on the needs of your readers. In the beginning, you may be unsure exactly how specific your articles should be to meet the expectations of your audience. As you continue to write, you may have or will discover better writing techniques and topics to capture your readers’ interests. Keep: The article contains quality tips, strategies, techniques, case-studies, analysis, opinions, and/or commentary based on your own perspective. Update: The article overall has value, but requires minor edits to bring it up to meet current quality standards. Toss: The article does not meet current quality standards, lacks originality, and/or lacks specifics. Test the links in your articles and the Resource Box. Use the Article Diagnostic Center to monitor whether your links are responsive and safe. Additionally, consider whether your links provide a great user experience. Keep Link: The link passes the quality test. Update Link: The link contains minor out-of-date features that can easily be removed. Toss Link: The link is entirely problematic; e.g., it’s unsafe and contains malware, viruses, etc. or the website has been blacklisted, deleted, or removed. Finally, you can measure the performance of your articles using the Performance tab of your My.EzineArticles.com account. Discover traffic, activity, and ranking data to help you fine-tune your articles for optimal performance. Are you an EzineArticles Diamond, Platinum, or Premium level member? Check out your Monthly Summary section for article performance reports featuring your traffic summaries and top performing articles. Don’t forget to keep your EzineArticles account up-to-date so we can continue helping you write and publish quality original articles to reach your goals. Click Your Account Accuracy Checklist for more details. Do you “spring clean” your article portfolio? What key indicators do you look for in outdated content? Have you found your quality standards have improved (or even declined) since you first started writing? What do you do to update your Resource Box and links? Let us know in the comments section below – we’d love to hear from you! I have some outdated content that I can’t promote anymore. I have 5 of them about the retired video platform of “Google Video”. I haven’t found a way to repurpose them… outside of using the strategies to teach the same tactics for Youtube marketing. I wish there is a tool that could help determine outdated articles and etc. You know outdated articles can help lose good readers. It gets boring because they keep seeing the same thing everyday. With these helpful tips it can help us improve our site and increase readers. Thank you for sharing. What is the minimum length of time that will elapse before an author can decide whether an article is performing or not? Good tips to grade the articles based on use and chronology. You mention “tossing” articles if they are outdated or poor quality. I can’t find instructions on the site for how to delete an article altogether. Can you help?